The Open Universiteit Nederland (OUNL) is the main distance learning university in the Netherlands and Flanders. Founded in 1984, it has 12 study centres in the Netherlands and 6 study centres in Flanders, with a total of around 15,000 students enrolled. OUNL and Universitat Politècnica de València (UPV) collaborated as partners in the EU project EMMA: European Multiple MOOC Aggregator (2014–2016). Prof. Dr. Marco Kalz, Full Professor and UNESCO Chair of Open Education at the OUNL, invited MLLP director Dr. Alfons Juan to give a talk at the OUNL on 20 July with the title “Integrating automatic subtitling and translation into MOOCs and OER repositories with poliTrans”, with a view to assessing the state of language technologies for the case of Dutch and their applications in open education and research. 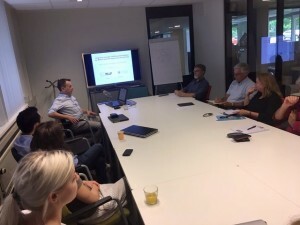 Several lecturers and researchers attended the session at the OUNL’s main site at Heerlen (Netherlands), including Prof. Dr. Kalz and Dr. Ansje Löhr, assistant professor at the OUNL and project leader of the MOOC on Marine Litter (developed with the UN’s Environment Programme). The presentation turned into a lively debate on multilingual subtitling technology and its current applications in education. Dr. Juan explained that in project EMMA it was measured that the time needed to subtitle 1 hour of Dutch-language video in Dutch and in English can be reduced from 40 hours (cost of manual subtitling and translation) to 15 hours (with the assistance of MLLP language technologies). The audience was very interested in the automatic subtitling demos shown by Dr. Juan. They were also able to try the MLLP’s most recent work in real time speech recognition with automatic language detection. We are grateful to have been offered this opportunity to present and discuss our work at the Open Universiteit Nederland, and look forward to future collaborations with the OUNL. Posted in All, Events and tagged Dutch, Language Technologies, MOOC subtitling and translation, OUNL.